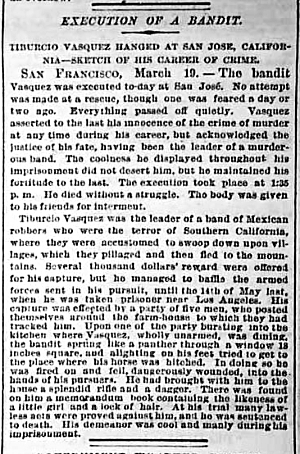 Tiburcio Vasquez Hanged At San Jose (NY Tribune, 3-20-1875). Tiburcio Vasquez Hanged At San Jose. March 20, 1875 (Page 7). Tiburcio Vasquez Hanged At San Jose, California  Sketch of His Career of Crime. SAN FRANCISCO, March 19.  The bandit Vasquez was executed to-day at San José. No attempt was made at a rescue, though one was feared a day or two ago. Everything passed off quietly. Vasquez asserted to the last his innocence of the crime of murder at any time during his career, but acknowledged the justice of his fate, having been the leader of a murderous band. The coolness he displayed throughout his imprisonment did not desert him, but he maintained his fortitude to the last. The execution took place at 1:35 p.m. He died without a struggle. The body was given to his friends for interment. Tiburcio Vasquez was the leader of a band of Mexican robbers who were the terror of Southern California, where they were accustomed to swoop down upon the villages, which they pillaged and then fled to the mountains. Several thousand dollars¹ reward were offered for his capture, but he managed to baffle the armed forces sent in his pursuit, until the 14th of May last, when he was taken prisoner near Los Angeles. His capture was effected by a party of five men, who posted themselves around the farm-house to which they had tracked him. Upon one of the party bursting into the kitchen where Vasquez, wholly unarmed, was dining, the bandit sprung like a panther through a window 18 inches square, and alighting on his feet tried to get to the place where his horse was hitched. In doing so he was fired on and fell, dangerously wounded, into the hands of his pursuers. He had brought with him to the house a splendid rifle and a dagger. There was found on him a memorandum book containing the likeness of a little girl and a lock of hair. At his trial many lawless acts were proved against him, and he was sentenced to death. His demeanor was cool and manly during his imprisonment.